Most of the Hindus & almost all of the HINOs(Hindu in name only) think & delude themselves that Muslims are ignorant, illiterate & unawares of sociopolitical scenario. Let us make things clear. All Muslims are literate & educated in their own language and not knowing English or a kuffar language is irrelevant to them. Knowledge (of course Islamic one) is accorded prime importance in Islam and every single Muslim is taught that since early childhood. Muslims know in & out about their dogma/faith/religion and have decent enough information about the rival faiths(including those of kafirs) even if its by cherry picking and used to deconstruct the kuffar religious principles. This ignorance is manifested at the highest level of our polity. Can see it in how we handle religious Abrahamic jihad aka terrorrism. Sending testosterone driven quran-filled adolescent jihadis to wage ghazwa upon kuffar Endia is the SOP of the terrorist state of Pakistan. Such terrorists must be summarily executed. Keeping them in jails for the vain hope that the terrorist state will be ashamed to death on seeing such “evidence” is nothing but suicidal imbecility. But we always do that and have paid heavily many times including that of IC814 in Kandahar. Its Suicidal naiveté to think that highest level or track-2 talks with a terrorist state created specifically to destroy us will even try for any farcical peace. After Modiji’s “confidence building” with Nawaz in Ufa, Russia, and subsequent rekindling of NSA level & other official military+civil engagements,terror attacks have only spiralled up exponentially in Endia (as momineen love to call our bhAratavarSha). Now whenever the ignorance withers away its replaced by Hindu defeatist fatal obsession with Abrahamics and can be seen best in we demanding Aurangzeb Road be renamed to APJ Abdul Kalam Rd and not after any Hindu hero howsoever big or really important to us. Aurangzeb Road must be Chhatrapati Shivaji Road, Akbar Road must be Maharana Pratap Road, Babur Road must be Maharana Sanga Road, Humayun Road must be Samrat Hemchandra Vikramaditya Road and all this should’ve happened right after 1947 and before 1950. And we always err fatally in not following the dictum that no non-Hindu should be deified. And that does not necessarily mean all Hindus are patriots. In a current context if one sifts through the posts on Kalam ji’s demise you’ll know of the genuine heartfelt respect the “hardline hinsutvavadis” have for him. But that should NOT translate into deifying non-Hindus. Hindus admire Israel greatly but always fail to notice that the Jews do never place any non-Jew on a pedestal even equal to a Jew. And that’s one of the simplest few reasons they survive against all odds. This is the problem with Hindus. Its good to respect great men who are not Hindu, sure,but its suicidal folly to put them on higher pedestal compared to our own great personalities, saints and Gods mass-psychosis of which was seen in the aftermath of Kalam’s unexpected demise. No Abrahamic will ever do such for a goyim/heathen/kuffar under any circumstance howsoever “good-intentioned” or secular the latter might be. And this self-destructive trait of projecting a non-Hindu much larger and bigger than the great Hindu saints & Gods was shown by none other than a Hindu missionary org(RKM). Shows the utter condition of decadent delirious dementia Hindus suffer now. 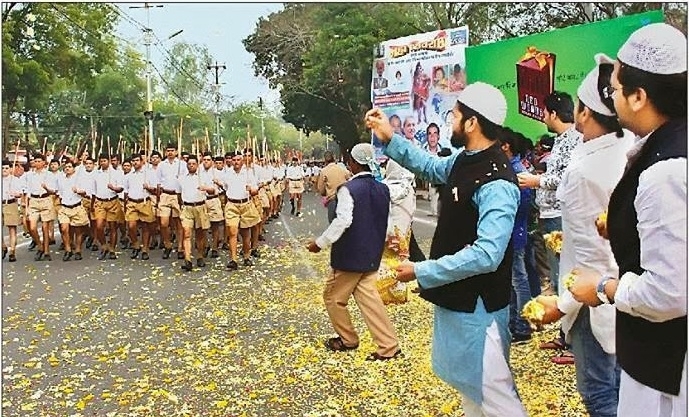 Taking further this scary reality ahead we take the case of infantile reaction/approach of Sangh Parivar(led by RSS) to Abrahamism, Islam in this context. Muslim Rashtriya Manch, a daughter org of RSS, was last seen hyperactive with an “Ulema meet”; Ram Madhav, RSS’s loan to BJP, despite the J&K debacle of amorous dalliance with a pro-separarist political outfit is again seen hyper too as Modiji is to address a huge gathering at a cricket stadium in Dubai. What’s brewing up within RSS & its parivar?? The widely acclaimed custodian of Hindus & Hindu interests!! Some Ram Madhav cannot be doing this without the consent and permission of the Sarsanghchalak & Sarkaryavahs, the top two tiers of Sangh!! The fatal obsession of RSS & BJP with Muslims to “win over them to our side” will lead to another partition as the former just have not understood the fundamentals of abrahamic infection. On the surface things look hunky dory but RSS & BJP are now in the pre-partition congress mode leading the Hindus to halal slaughter houses in not so distant future if something radical does not shake up the Hindu core. And to tell you frank,blunt & upfront you escapist, lackadaisical, haughty, lazy, deracinated, idiot, self-deluded, arrogant hallucinating Hindus & HINOs! You who underestimate the abrahamics (esp Muslims) and overestimate yourselves: even a ragpicker riffraff Muslim is far superior to you in being knowledgeable and aware about local & global sociopolitical plus geostrategic affairs compared to you supercilious, soporific & suicidal slaves who exist only to offer their necks for slaughter at the hands of Abrahamics. Better mend your fundamental physical and mental constitution or you’re doomed to be annihilated! Which either you do not know of or do not want to accept in minds or worse that you’ve already accepted you being halaaled at some point in time.. Amin! Islam has cemented its position as a legitimate alternative to western civilization. Truth may be harsh but Hindus are not even in the race. The article was first published here. The author tweets as @Shakra_Kulish.